Recently, I shared with you an announcement by Family Tree DNA about the expected update to their Family Finder autosomal DNA product. Family Tree DNA sent an e-mail to their project administrators yesterday evening providing additional information about their update that will be following shortly. Their verbiage follows, but this additional information removed some question about how matches will occur. Some people, me among them, were concerned that the new matching algorithm would remove all matches below 9cM. This would happen if the new algorithm replaced the old one. I’m very pleased to report that’s NOT the case. This new algorithm has been implemented in addition to the old one that required 20cM and 7.69 cM or greater longest single segment. If you don’t match utilizing the old algorithm, you get second chance now with the new one that has no total cM requirement and a minimum segment length of 9cM. If you match either way, that person will be on your match list. Blaine Bettinger created a handy-dandy flow chart showing this process. Family Tree DNA has refined their matching algorithm somewhat, but the net effect of this should be that people will have more matches, but no new matches under 9cM and few losses, unless it’s from the algorithm tweaking. As you look at your new matches, also keep in mind that some of your new matches may simply be because people tested and their results just happened to come back during this time – so if you do see a match under 9cM that’s new – this could be why. It may not be a result of the change, just a function of timing. Those of you with Jewish heritage that were worried about being overwhelmed with matches, you can worry a little less. Family Tree DNA has maintained their proprietary routines that attempt to minimize the noise in Jewish matches. After months of research and testing, we’re implementing those changes as soon as the quality assurance process is complete, which should be within the next few days. Until now the amount of shared DNA required for two people to show as a match was a minimum of 20 total centiMorgans of shared DNA with a minimum longest block of at least 7.69 cM for 99% of testers, 5.5 cM for the other one percent. With the adjustment, if two people share a segment of 9 cM or more, they will show as a match regardless of the number of total shared cM. However, if there’s not a block that’s 9 cM or greater, the minimum of 20 shared cM with a longest block of 7.69 cM applies. We also slightly altered other proprietary portions of the matching algorithm that will, to a small degree, affect block sizes and total shared centiMorgans. These changes should have only marginal effects, if any, on relationships, generally in the distant to remote ranges. There’s a separate proprietary formula that is also applied to those with Ashkenazi heritage, but you can, of course, expect to have more new matches than those not of Ashkenazi heritage. The entire existing database has been rerun using the new matching criteria, and all new matches have been calculated with the new thresholds. Please keep in mind this change will not affect close matches, only distant and speculative ones. Some matches will fall off, others will be added. Most people will likely have a net gain of matches. Your myOrigins results may change slightly with the rerun, but we have not updated or changed myOrigins yet. We’ll let you know when that happens. And that’s not the only good news we have! Some of you may have dealt with mtDNA results that had some issues with genetic distance. The fix for the root cause of that problem was released awhile back, but we had to wait until all the hardware installations were complete and integrated before re-running those kits affected prior to that fix. We’re in the process of deploying that update now! Over the next few days, those affected will likely see differences in genetic distance of some matches as the corrections are implemented. Those who have tested after the fix whose mutations were correct may see an increase in matches to existing testers. That’s to be expected. Thank you for your patience through the process. This entry was posted in Family Finder, Family Tree DNA, Mitochondrial DNA and tagged General Information by Roberta Estes. Bookmark the permalink. Thx Roberta for keeping us informed. There is obviously still something wrong with Family Finder. E.g. I have one FTDNA match, over 130 cM (with 23andMe transfer kit over 140 cM) and estimated 2-4 cousin. In my match list but not visible in my parents’ match listed. I don’t quite believe his segments with my parents are so small that he is dropped below tresholds for both of my parents. In general, if someone is visible in just a child’s list he or she might be related via both parents – but not over tresholds for them, just for the kid. But when the total amount is more than 130 cM (especially for a Western Finn without any striking endogamy) there must still be a bug. I have informed FTDNA about this strange result some time ago, and I hoped this FF update would fix it. But the problem is still there. Thanks for details, Roberta. 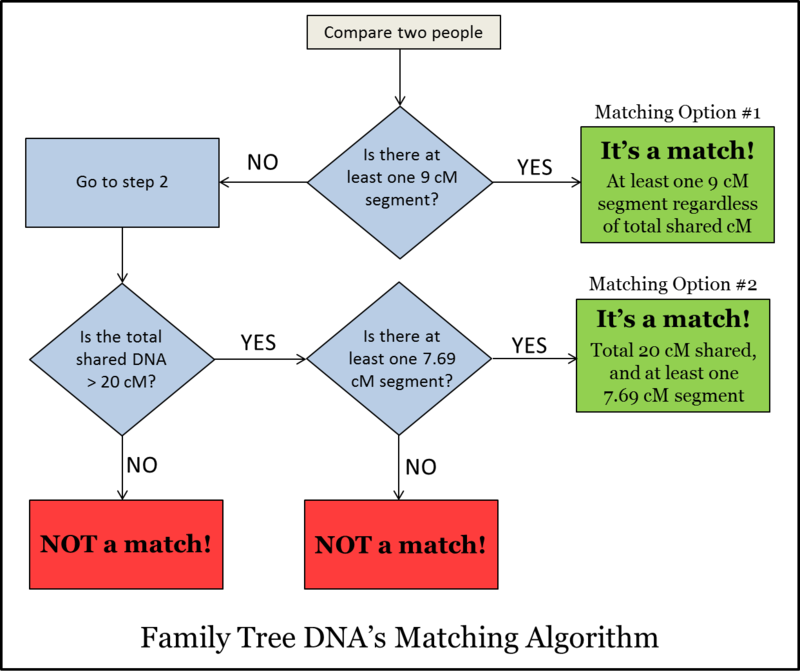 The new rules should help to get more significant X-DNA matches which don’t share enough autosomal DNA to reach the 20cM threshold. I will be reporting it soon. I’m working with another FTDNA member who is seeing the exact same behavior among her immediate family members’ kits. We suspect it is a widespread problem. Oh! It’s indeed fixed, my two matches from last december who were wrongly 3 mutations away are now zero mutations away! I received new African/American matches this morning. They all match at the same segment, same chromosome as one other match I already had. I am 3% African and maybe all these new matches will at least help in narrowing down the geographical area where our match originated in this country. When my Mom tested at 23andme at my request, her results included a tiny bit of Subsaharan African (in the Speculative mode). In using the one-to-many matching tool in Gedmatch, I have quite a few matches with typical African mtDNA and Y-DNA haplogroups. Is this the way you have determined that your new matches on FTDNA are indeed African-American, by the haplogroups listed for them? I am still learning about matches, having for years focused much more on ethnicity estimates, so there’s plenty I don’t know yet. Many thanks! Roberta, I recently received an email from MyHeritage inviting me to upload my DNA data to their system and they would perform a match for free. I’ve tested with Ancestry and FTDNA. Do you think this is a good idea? When are they going to send us our updates to FTM? 1. They have deleted the root person’s name that used to be at the top. 2. When I zoom, the tree map no longer works with the cursor being at the center of the display region, but you have to start taking little steps with the cursor or the display will be far away from the tree. 3. The Ancestry View nicely defaults to 4 generations, rather than 15. However, I would still like a pedigree option for this view (AncestryDNA did a nice job for that). 4. It would be nice to be able to use the cursor keys (arrows) to move around the view rather than dragging with the mouse or using the tree map — like the census image display at Ancestry. 5. At this point, the DNA Matches do not seem to be working and I never was real sure how to use that. Maybe it would help comparing my tree to the one displayed. I find it very time consuming to find surname matches in trees (one of the nice features of the hints at Ancestry, though other things are not so great there). Maybe I just don’t know how to use it well enough (but it has to work first). Overall, it seems like the family tree display is in a beta test mode and I am not sure why they changed it. Thanks for any help or if you agree with the comments and can provide feedback to ftDNA folks. They don’t seem to hear those of us who send comments.